Betsey Johnson Stores Going Out of Business Sale! Recently MarkdownMom was in San Francisco and while bargain shopping in the Westfied Mall walked into a super sale at the Betsey Johnson Store thinking that this was a singular store closing–au contraire. Betsey Johnson has had to file for bankruptcy; the silver lining is that she will continue as creative director of the line that will still be marketed by Macy’s and other retailers. What does this mean for bargain hunters? Right now you will find her apparel, jewelry and shoes at the stores that are closing at 40%-60% off and more. However, you have to hurry because inventory is shrinking because of these fabulous savings. Additionally, current prices at her online site are reduced 40%-65%. Plus MarkdownMom found select pieces of her jewelry reduced 50% at Macys and other retailers. It was announced today that Shopko will takeover the Pamida chain. Shopko will keep its’ current stores and rename its’ acqisition of Pamida to Shopko Hometown. The changeover will occur over the next year. HQ will be in GreenBay Wisconsin with a combined retail entity of nearly 350 locations in 22 states. At present, Shopko has 149 stores in 13 states and Pamida operates 193 stores in 17 states. Pamida previously had been part of Shopko for 6 years prior to 2005. More and more pharmacist-owned drugstores are being consumed by the large chains. We have seen this occuring in Minnesota for a number of years now. It is difficult to point to one single factor in the demise of owner-operated drugstores. Part and parcel has been the economic downturn that adversely affected all small businesses, the buying power and lower prices of national chains, and with this business, to some extent, it may have to do with the uncertainty of the impact of the new Health Care Bill. But, no matter what the causality, expect more local drugstores to be closing. 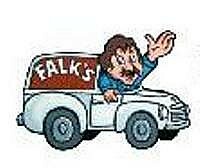 Locally in Duluth, Minnesota Falks, a chain started in 1939, has announced the closing of its’ remaining 7 neighborhood store with the exception of its’ Kenwood store being sold to to the Walgreen’s chain. They have begun marking down their current stock. Everything is on sale including greeting cards, health and beauty aids, over-the-counter mediccations, gifts, school and office supplies, toys, Willow Tree, store fixtures, furniture and equipment. Sale begins Thursday, January 20th-January 26, 2010. Snyder’s Drug Store opened in 1928 in Minneapolis, Minnesota, is now closing. A victim of national giant chains such as CVS and Walgreen’s, 25 stores in Minnesota have been purchased by Walgreen’s. It is undetermined which stores will close and which ones will open as Walgreen’s, however, Markdown Mom went to the one in Roseville on Saturday and found up to 75% off. This included over-the-counter drugs. cosmetics, diapers, toilet paper, even disability aids like canes and wheelchairs. Even white strips for your teeth, reg. $44, were only $13! Be sure to check if they are selling their store fixtures as well since these are great repurposed for additional storage. Do you have a couch potato pussycat? Does he or she spend more than 18 hours a day sleeping: Well, it’s time to get that fur kid moving with this latest cat toy. All of us who have used a flashlight playing off a wall or floor, know how much our pets love playing tag with a moving light. Plus this is in keeping with that other hit toy, the Panic Mouse. This toy is designed to provide many hours of fun for your feline friend. Improvements Cat Laser Toy at HSN for $19.99 + sh. KB Toys are the latest in a string of retailers facing closures. Last Thursday, for the second time in its’ history KBToys filed for Chapter 11 Bankruptcy and plans to close all of its stores. First of all, it’s a sad state of affairs to see retailers going down, this means job losses as well as revenue losses for local and state governments. Having said that, with so many stores going out-of-business, how do savvy shoppers shop these stores? 1. For the largest selection, shop early. Deeper price cuts mean less inventory to select from. Besides selection, quality diminishes as time goes on. However, have some idea of the original prices of the merchandise to ascertain a deal. If a professional liquidator comes in, items on clearance prior to the closing sale, may be returned to full retail price and then discounted by 30%-40%. 2. Check return policy. Even if store is facing Chapter 11 and closing, some will accept returns within a limited period. 3. Some of the best deals are found in buying display items. Usually these items even in a store not facing closure are discounted by 30% when a new model comes in. To insure that you don’t get stuck with an item of electronics that fails soon after purchase, make sure that even if you buy it without a box, you get a warranty card to fill out with your purchase. 4. Make your purchases using a credit card. Your credit card will provide some protection to recover your money should the item fail. Additionally, some credit cards will sell you extended warranties. 5. Stumped for gift ideas, don’t buy a gift card from a store going out of business, opt out to buy a bank gift card. A bank card will allow recipient to use it at the store closing and other stores as well. However, be sure to check to see if there are additional fees or expiration dates associated with the bank card versions of MasterCard, Visa, American Express, etc. Weekend Back-to-College and Back-to-School savings have finally arrived this Labor Day. You will find the stores crowded as the reality of getting the kids and your college bound young adults ready and settled in for another school year. One red hot sale is at Lane Bryant where you can save 75% off msrp. With sizes from 14+ there is a terrific selection of tops, short jackets, and slacks including shorts and jeans. With warm temperatures still a part of our weather, you can save a bundle on fashion. Bonus: Lane Bryant has extra coupons good on clearance merchandise. Online Bonus: use Free Shipping promo code L0198 through September 2. JCPenney® has some 75% off racks, but selection is limited. Best bet for shoppers are found in the petites and misses. Some items in housewares include 300 Egyptian sheets sets reg. $130 for $29.99. Bonus: Ordering online, save shipping on orders of $49.99+, promo code LABOR DAY good through September 5th. Whitehall Company Jewelers®. Another store is in the process of going-out-of-business as part of its’ liquidation of 89 stores following filing Chapter 11 Bankruptcy. This may be the time to check for that special someone in your life to find that keepsake at a great price! Right now, the remaining stock is marked 40% off. Store Closings: Is It Bargain Hunting Season for Techies? The Dallas-based chain, is closing half of its’ store in the U.S. in the next 60-90 days to around 103 stores left in the U.S. and Puerto Rico. The company sites store closings in poor producing revenue locations and outdated stores in an effort to streamline its’ operations and bring its’ balance sheet into the black, which has received a hefty infusion of capital from its’ parent company Mexican-based Grupo Carso S.A. One of the first stores to close is in Minneapolis, Minnesota where the liquidation of merchandise has already started, although MDM believes because of the latest snowstorm conditions, customers will not be able to get to the bargains until Saturday at the earliest. Handling the store closings will be Gordon Brothers Retail Partners, LLC. Gordon Brothers, among their many diversified investment interests in the consumer products and retail industry, is a liquidator that typically buys the inventory of the store(s) being closed or going out of business and then conducts the sale. Other computer-based retailers downsizing is Circuit City that announced earlier in February that it will close 8 stores in the U.S. and 64 in Canada. Best Buy seems to be one of the few left standing. To find out what store locations remain for CompUSA, go to their site. Rampage™ is having a store closing at MOA. This is the perfect chance to pick up Lindsay Lohan and Jessica Alba looks without the hit to your wallet. The store closing promises 60% off of all clothing items and 50% off of hats and other accessories. Items are limited so make sure that Rampage™ is your first stop at MOA. 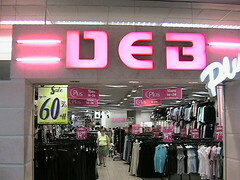 Deb stores™ has a 60% off summer styles blowout! Summer clothing features gaucho pants, capris pants, jeans, shorts, tees, camisoles and much more. To get the best prices, start towards the front of the store near the cashier’s counter. Many of the styles can be matched with other clothing items and accessories to create the perfect outfit for a day at work or a night out on the town. In addition to summer looks, keep your eye out for the rouge sweater from last fall. MDM picked a navy blue sweater up for a steal at $1. The most avid of MarkDown Mom bloggers cannot afford to miss the Banana Republic™ sale! Banana Republic has a storewide sale of 60% off of both men’s and women’s fashion. MDM especially loves the embroidered cotton dress in tarbaya green (reg. $118.00, on sale $59.99), which is very reminiscent of Ann Hathaway’s green dress in "The Devil Wears Prada." Pair dress with a large brown belt and layered necklaces to capture the look.